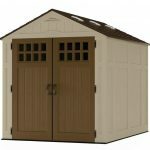 The Suncast Adlington 3 Apex Roof 8 x 6 Shed is a very stylish shed that has a cream and chocolate look to it that gives it a very classy appearance. It offers a generous amount of storage space so things like tools, gardening equipment and even things like children’s garden toys and bikes will fit inside. A large set of double doors make it very easy to put things in and take them out of the shed. These doors have a few windows on them which along with the way the roof acts as a skylight makes for a shed that has a good amount of natural light inside it. As well as natural light, air can get into the shed thanks to some smartly placed air vents. The latest blow moulded technology has been used for this shed and that makes the resin that it is made from extra strong. This material that the walls are made with also take away the need for any kind of frame. The whole shed is very strong so it is going to give you many years of use. As an added bonus, the shed requires no treatment or any kind of upkeep at all. This is one of the best sheds from Suncast. It offers a good amount of storage space, looks great and will last for many years. We are big fans of the Suncast range and the Suncast Adlington 3 Apex Roof 8 x 6 Shed is a shed that really caught our attention. This is actually a very good size as it is 8 feet deep and 6 feet wide. 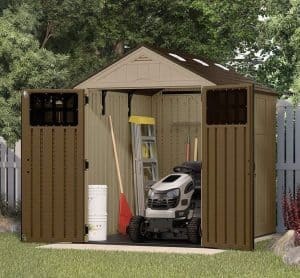 This means that even gardens that are a little on the snug side will be able to give this great looking shed a home. 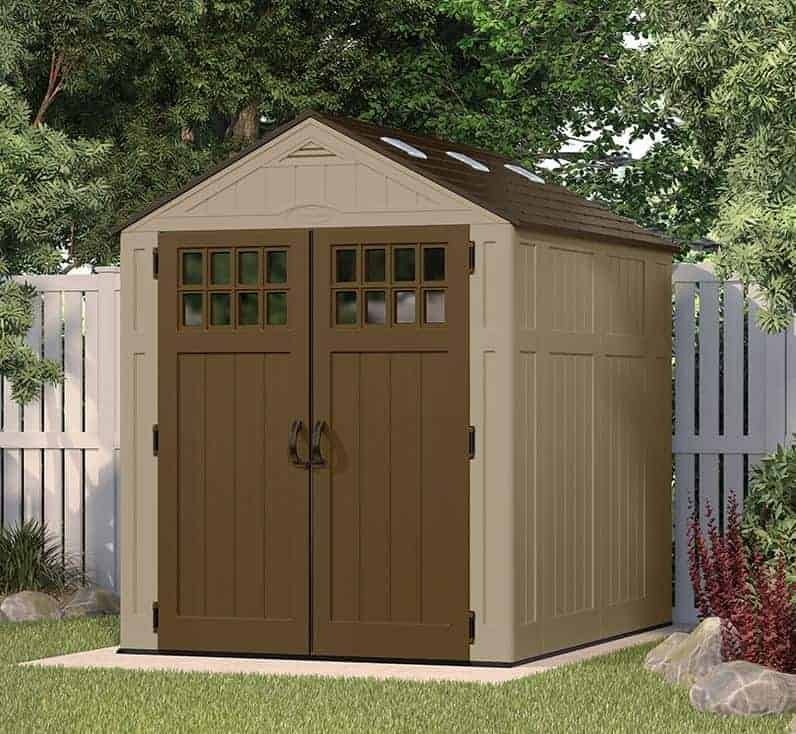 Speaking of great looking, we really like the overall style of this shed and feel that the cream and chocolate brown go together very well and give the shed a really smart and modern look. Along the ridge of the shed the height is 7 feet 9 inches which is actually pretty incredible for a 8 X 6 shed. Overall when it comes to style, this is the kind of shed that is perfect for people who want a shed that is more modern looking. The apex roof looks incredible. 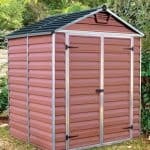 It is made with the same kind of resin as the rest of the shed and it has been reinforced with metal. We really like the slate/shingle look that they have gone for here and in all we just love the look of this roof. While we have been giddy like a schoolgirl at a Take That concert about the looks of the roof, we must say that the roof is very strong, long lasting and will certainly keep the rain out. Also there are some air vents located on the roof as well which will keep it from getting too hot in there during the summer months. The panels that make up the roof also serve as a skylight so natural light can get in through the roof which is something we like. As this is a plastic shed the Suncast Adlington 3 Apex Roof 8 x 6 Shed of course does not have traditional cladding. It may look like it does at a glance, but this shed is actually made from resin that has been made with a technology called blow moulding. We put on our glasses and lab coats and still cannot come up with what exactly this is, but what we can tell you is that it is thick and solid. We really like this and can honestly say that Suncast are one of the best when it comes to plastic based sheds. Like the other Suncast sheds we have seen there is no frame inside this shed. The reason for this is not a money saving tactic, it is simply because there is no need at all for one. The way this shed is made and the way that the panels slot together and then are secured together takes away the need for any kind of frame. This is a plastic shed that does come with a floor, which is not always the case. The floor is very high quality and made once again from a strong kind of plastic. Now this is no ordinary plastic. It is made so well that it is able to take an incredible amount of weight. So much weight that heavy duty tools, mowers, safes and anything else you may need will be ok sitting on this floor. 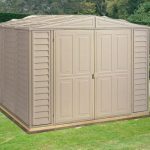 The Suncast Adlington 3 Apex Roof 8 x 6 Shed is as low maintenance as you can get. First of all installation is very easy, but once you have installed it, you do not have to worry about needing treating or anything like that. There is no treatment required and even cleaning the shed is easy to do. You can get a cloth and a bucket of water, or if that is too much work just blast it with the garden hose. 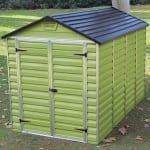 Like the other Suncast sheds we have looked at this one comes with a ten year guarantee. This is a very fair guarantee and due to the materials, we do not actually see you needing to call on this guarantee. There is nothing worse trying to get something big into a shed with a little door. Thankfully the Suncast Adlington 3 Apex Roof 8 x 6 Shed has a fantastic set of large double doors. 5 feet 9 inches is the width and 6 foot is the height, so this is a great set of doors. You will have no trouble at all getting things in here. Even your kids will have no excuse not to put their bike away as it will be very easy. We love the chocolate kind of colour that these doors have and feel that it goes very well with the rest of the shed. There is a small section of windows located on the doors and we really like these. The panels used for the roof work as a skylight so it is not like the shed needed windows to let in natural light, so they are more of a stylistic choice and it is a choice that we feel works very well. There is no included lock with this shed and that is what we expected as we have yet to see a shed from Suncast that does have a lock. 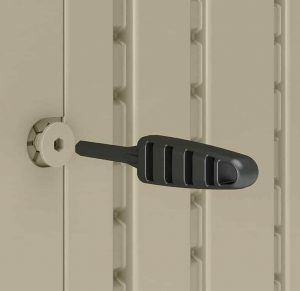 However, Suncast were very smart with their design as they have made it so it is very easy to slap a padlock or chain onto those large door handles. So while it does not come with a lock, if you did want to add one then it is easy to do. One thing that we really like about this shed is the way that it is so private. It is not dark and dingy thanks to the windows on the doors and the roof acting as a skylight. But it is not easy to look inside here and see what is going on. This is one of the most private, but illuminated plastic sheds we have seen and we think that the clever design is the reason for this. We have looked at a few Suncast sheds and this section is always the same. There is no way to customise a Suncast shed. The materials used do not allow for any kind of customisation. This though is not a bad thing as the look of the shed is great and we do not think it needs any tinkering anyway. As far as the extras go, none are actually offered with this the only thing that we would suggest is some kind of padlock if you have any expensive items that you plan on putting in the shed. We honestly have nothing bad to say about the overall quality of this shed at all. Suncast really have done an incredible job with this shed. To say that you can get a lifetime of use out of this shed is not an exaggeration. The materials used here are low maintenance and will not age or decay in anyway. This is offering you a good amount of floor space. 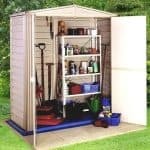 The generous height of the shed also means that you will be able to stack things up pretty high as well. One of the best things about Suncast sheds is just how easy they are to install. This really could not be any easier and with the help of a friend you are looking at a few hours max. The only downside to this shed is the price. 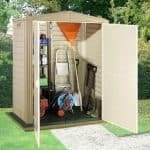 This is one of the most expensive 8 X 6 sheds we have seen in quite some time and while we understand why the price is what it is, we are sure this will put off many people. The Suncast Adlington 3 Apex Roof 8 x 6 Shed is one of the most impressive 8 X 6 plastic sheds we have seen in quite some time. From the floor all the way to the very top this is just high quality. Suncast have not cut any corners here at all and we applaud them for that. If you want the best of the best then this is the kind of shed that has to be on your shortlist. 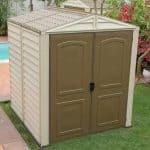 Now as incredible as we think this shed is, the fact is that it is very close to the one thousand pound mark and when you can get a 8 X 6 shed for over half of that price, it does take a little shine away from this shed. But we say if you can afford it or even are willing to save a little bit longer, you will not be disappointed with this shed.